Johnson-Perez wasn’t as hot a ticket seller as the sold out Hart-Johnson event in March. Still, the match drew a reported 721 fans to the 2300 Arena. Peltz Boxing, Bam Boxing and Joe Hand Promotions were the promoters. 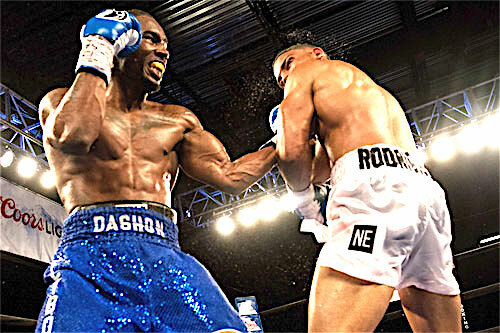 Escondido’s knight in shining boxing gloves Dashon “Fly Boy” Johnson came back to Philadelphia Friday night and left another good impression on local fight fans with an active and entertaining 8-round unanimous decision over DeCarlo Perez at the 2300 Arena in South Philly. It was a close and competitive battle. However, Johnson’s bookend knockdowns, one in the first and one in the eighth, gave him the edge he needed to secure the win. After giving Jesse Hart a hard time in March, Escondido, CA’s Johnson returned east to turn his attention to Atlantic City’s DeCarlo Perez. Things got started prematurely at Thursday’s weigh-in when a photo op between the two fighters boiled over into a near brawl. The eruption was quickly capped and then reopened in the ring for the fans on fight night. Left cross courtesy of the Fly Guy. Johnson jumped out in round one and dropped Perez with a hard flurry of punches that nearly ended the fight in a hurry. Despite the quick start by Johnson and close call for Perez, the fight was a closely pitched battle for the rest of the night. Johnson took the first two rounds before Perez began closing the gap with a nice jab and some extremely accurate punching. However, as with his fight against Hart, Johnson proved to be difficult to control. Regardless of whatever punches Perez whipped at Johnson, the Californian kept chugging forward, looking for an opening to exploit with his harder punches. Johnson’s best weapon is a right uppercut, and he found Perez with it repeatedly. When Perez boxed, he was in control. However, DeCarlo appeared set on proving that he could fight with Johnson on the inside. This gave Dashon many opportunities to land his harder punches. However as the fight progressed, Johnson lost steam and Perez managed to bring the score closer and closer. In fact, when the fighters entered the final round, my scorecard was dead-even, 66-66. So at least on my card, the winner would be determined in the eighth and final round. Both fighters pressed the action in the eighth, working to earn the victory. However, this wound up playing in Johnson’s favor. 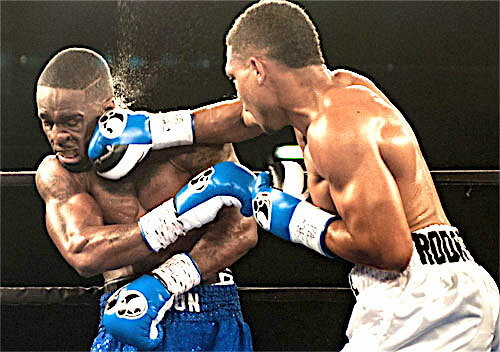 Dashon cracked Perez with his money shot, a booming right uppercut, and the punch deposited Perez on the canvas for a second time. Perez rose to his feet, but this return trip to the canvas sealed the deal for Johnson and put the decision out of reach for Perez. The three official judges scored the fight for Johnson, 76-74, 77-73 and 78-72. My score also favored Johnson 76-74. The win improved Johnson’s record to 21-19-3, with 6 KOs and 1 No Decision. Twice now, Johnson has shown Philly fans that he is a real crowd-pleaser. 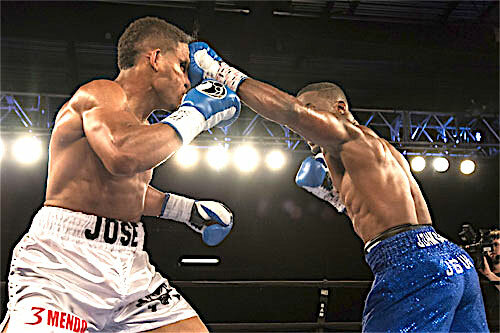 His victory was not just a win over Perez, it was a stump speech in his campaign to land a rematch with Jesse Hart, who decisioned him three months ago in the same ring. A rematch would truly excite the fans. We love Jesse Hart, but that doesn’t mean we don’t want to see him in great, competitive fights. Their first meeting was exactly that. DeCarlo Perez, 15-5-1, 5 KOs, fought hard but came up just short. Philly-based Georgian Kaba Khositashvili, 12-3, 1 KO, pitched a six round shutout over Henry Beckford of Roosevelt, NY, 3-5, 1 KO, in a super middleweight bout. Kaba scored a knockdown in round four and won by three official scores of 60-53. Southpaw flyweight Chayanne Rivera made a successful pro debut against Texan Gene Gonzales. The Bronx fighter won all four rounds. Rivera cut Gonzales, 0-2, in round three, knocked him down in round four, and won the bloody unanimous decision by three scores of 40-35. North Philly’s Steven Ortiz improved to 4-0 with a four round unanimous decision over Atlantic City war horse Osnel Charles, 10-15-1, 1 KO. The scores were 40-36 twice and 30-37. Middleweight LeShawn Rodriguez, 3-0, 2 KOs, Coram, NY, dropped Atlanta’s Phil LeGrand, 1-3, 1 KO, once in round three and once again in the fourth, en route to a fourth round knockout. When LeGrand hit the canvas the second time, referee Gary Rosato stopped it immediately and called it a KO at 2:35 of the fourth (and final) round. Baltimore-born heavyweight Cassius Chaney remained undefeated, 7-0, 4 KOs, by pounding out a four round unanimous decision over Ray Lopez of Holland, MI, 4-13, 2 KOs. Chaney regularly raked Roy to the body and consistently landed to the head to earn three official scores of 40-36. In a four round lightweight fight, North Philly’s Jerome Conquest, 6-1, 1 KO, defeated Germantown’s Korey Sloane, 2-10-2, by unanimous decision. The scores were 40-36 and 39-37 twice. In the opening bout, middleweight Isaiah Wise, 2-0, 2 KOs, stopped Vineland’s Jamil Gadsden, 0-8, at 1:37 of round one. Wise, North Philadelphia, backed Gadsden into a corner with several hard rights and then fired away with both hands until referee David Franciosi stepped in. Reprinted by permission. John DiSanto has made it his mission to present and preserve Philadelphia boxing history . He also covers the current boxing scene. To read more about the Philly fight scene – past and present – visit www.phillyboxinghistory.com. Be the first to comment on "‘Fly Boy’ stuns Perez at South Philly bout"